Former consultant to Ronald Reagan and conservative heavyweight Peter Hannaford died in his sleep Saturday night, just hours after appearing at an event at Eureka Books to celebrate the publication of his newest book. He was 82. 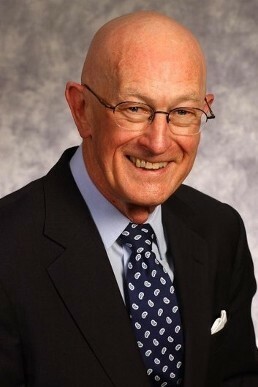 Perhaps best known locally for his stint as the opinion page editor for The Eureka Reporter, Hannaford served as Reagan’s senior communications advisor during his run for president in 1980. 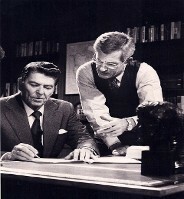 A native of Glendale, Hannaford — and his public relations firm Hannaford and Deaver — is widely credited with masterminding an elaborate PR campaign that kept Reagan in the public eye from the time he left the California Governor’s Office in 1975 until his successful presidential bid. The plan included regular speaking appearances, a newspaper column and weekly radio commentaries; commentaries that Reagan took with him to the Oval Office, launching the Saturday presidential radio address that his predecessors have continued. According to this National Review article, Hannaford penned many of Reagan’s addresses, commentaries and speeches. Hannaford and then-presidential candidate Ronald Reagan. Hannaford edited the popular opinion page of the Eureka Reporter and penned regular editorials until well after the paper folded in 2008, under a peculiar arrangement that saw the Times-Standard publish a Eureka Reporter editorial page in its Wednesday and Sunday editions through 2009. He’s also been intimately involved behind the scenes in local politics, advising a number of campaigns and doing press for the Humboldt County Republican Central Committee. Most recently, Hannaford sent out press releases announcing the candidacies of three people vying for seats on the Humboldt County Harbor, Conservation and Recreation District Commission. The extent of his involvement in the campaigns beyond that is unclear. When the Journal set out to find Humboldt's smartest resident last winter, someone pointed us Hannaford's way but the octogenarian humbly and affably brushed us off. Voted Humboldt’s 2014 Republican of the year, Hannaford authored or edited 10 books, six of which were about Reagan. He was on hand at Eureka Books on Saturday night signing copies of his latest offering, Washington Merry-Go-Round: The Drew Pearson Diaries, 1960-1969, a collection of writings by the 1960s investigative journalist. Hannaford is survived by his wife of six decades, Irene Hannaford, two sons and two grandchildren, according to an obituary in the Times-Standard. A memorial services is scheduled for Saturday at Christ Episcopal Church.